Coming into school this morning, I was amazed at how many people were actually talking about The Oscars- of course, I realised that some would be talking about the spectacle and others, the pure celebrity base instinct that some seem to have inbuilt but instead, today, people were talking about the films. Whether they liked them, whether they thought the right person won and in the very rare occasion, listening to a conversation between boys over whether the winners should be based on their look (in regards to actresses), of course none of this geared them up for the machine that I was when people were getting the winners wrong or they hadn't heard of Sean Penn!!! Last night, marked the beginning of the new film year and while sitting in assembly today, our Deputy Head spoke to us about the Oscars. I wondered on first impressions, whether in our traditional chapel, the talk would be purely sensationalist and celebrity, thankfully I was wrong. Instead we were given The Oscars as a window of opportunity, take away from this what you will, but she started talking about opportunity and accomplishment. What have you done with your life which can place you where you are now? What are you going to be doing with your life, your days and your attitude to people and work that will get you where you want to be? These are all accomplishments and at the end of the day- these are what people can and will judge you on. Whether you want to be a vet, a singer, a lawyer or an actor, they all need work and accomplishment to get to where you want to be. During one of my breaks today, I sat on YouTube watching the Oscars from last night and was inspired by every single person in the room. There was a spark in there which collectively shows the accomplishments that these people have made and the actual difference they make to people's lives. Now, don't get me wrong, I defiantly understood where my Deputy Head was coming from when she asked a very simple question. "I bet most of you know the winners from last night, but who knows who won the Nobel Peace Prize last year or who are the nominations this year?" (By the way, last years winner was Martti Ahtisaari for "for his important efforts, on several continents and over more than three decades, to resolve international conflicts") and yet that hit a nerve with me. I reckon 99% of the people listening didn't know the answer and yet were enthralled by the shiny glamour of last night's event which leaves me to question where the peace prizes of the future will be going because if my generation don't have an understanding of the process but are instead charmed and fascinated by the glitz and the glamour. The sad truth is that as time goes on, it will lay upon those who do have an understanding to stand up and guide the rest of those before they get left in the storm- becoming just another person. People are always saying that everyone wants to become a celebrity but instead why don't we change the definition of celebrity? Why not look upon this person as someone who stands out from the crowd but also understands the moral practices behind something like the Peace Prize- someone who leaves their positive mark on the world is a celebrity. Not just someone who sleeps around and then sells their story to the media! So back to last night, take a towel and rub away the shiny, vulgar glitz attracted to such an event and instead look at that little man- Oscar. Look at the accomplishments that people have made to be awarded that little man and what he means to those who have the blessing of holding one. The prestige which comes with him is something that only those in the exclusive group of winners will ever understand and it will never be able to come out in a media article. Did the right people win the awards? That's down to personal opinion. Britain certainly had something to celebrate with homegrown talent turned international star overnight, Danny Boyle directing a film which has equaled the Oscar success of 'Ghandi' starring Ben Kingsley. 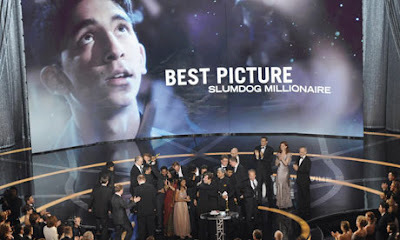 'Slumdog Millionaire' which I covered in my previous post went on to win eight out of the 10 nominations including Best Director and Best Film. Director Danny Boyle, 52, bounced up and down in delight as he received his award, telling the audience: "I swore [to my children] if this miracle ever happened I would receive it in the spirit of Tigger." The film, set in the slums of Mumbai (Bombay) also won awards for best adapted screenplay, cinematography, sound mixing, film editing, best original score and best song. As anticipated - after years of waiting, Kate Winslet, 33, won her Academy Award for playing a Nazi prison officer in The Reader. "I'd be lying if I hadn't made a version of this speech. I think I was probably eight years old and staring into the bathroom mirror," she said. "I feel very fortunate to have made it all the way from there to here." In a night of predictable outcomes, Sean Penn's best actor triumph for his portrayal of gay rights activist Harvey Milk seemed to win the A-list audience's approval. "You Commie, homo-loving, sons of a gun," said Penn, addressing his fellow performers. "I did not expect this, and I want to be very clear that I know how hard I make it to appreciate me ," said the 48-year-old, who often attracts criticism for his outspoken views. In an impassioned plea - and to rapturous applause - Penn called on "equal rights for everyone". "I think it is a good time for those who voted for the ban against gay marriage to sit and reflect and anticipate their great shame," he said. His thoughts were echoed by Milk screenwriter Dustin Lance Black, who won best original screenplay for Milk. "I heard the story of Harvey Milk and it gave me hope ... that one day I could live my life openly as who I am. And that maybe I could even fall in love and one day get married," he said. 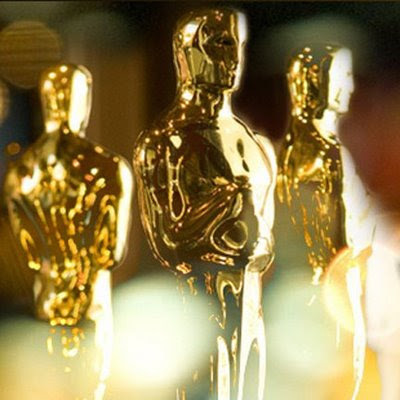 Here is the full list of winners at the 81st Academy Awards, which have been held in Los Angeles. Over ten of my predictions were correct, check the next post to find out what I said yesterday! Why have I written about The Oscars in this way? Because everyone else has written in the same way and... because I can.